So how does one make a huge half sphere cheaply? Plexiglass? Sounds like a tricky proposition. Is it even strong enough? Fibreglass? Carbon fibre? maybe for a prototype but them mass producing them? The more I thought about it, the more I realised it couldn’t be made in one piece anyway. How much would a 1.3m x 1.3m x 1m parcel cost to the US or Japan? It would have to be assembled, which means I had to think about base elements first. i.e. breaking the sphere apart. 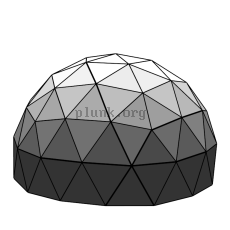 Geodesic domes seemed a good possibility and plunk has some great info on building them. If I could make a dome from triangles with a curved exterior it would be easy right? Wrong. The more complicated the dome the more types of triangles are need. The 5/8 dome above wasn’t just 1 triangle, but 5. If I wanted to make something the few parts the better. Next PostWe’re on the Ball!